If there’s one thing we can learn from the last two Battlefield outings, set in their particularly crisp and atmospheric renditions of World War 1 (Battlefield 1) and World War 2 (Battlefield 5), it’s that war back then was carnage. These were times when humans had little answer for the ruthless rise of machinery; a notion best represented by the semi-fictional Behemoths of Battlefield 1 that were designed specifically to annihilate the winning team and balance out the battle. The idea of Deus Ex Machina doesn’t get more crude and literal. But as I’m about to get chopped down by another unseen biplane in Battlefield 5, or decimated by a Tiger tank from across an impassable expanse, my shellshocked mind retreats to a time when gung-ho heroics never felt out of reach; when a single moment of derring-do by even a two-man squad could take down a tank or swing the tide of a battle. I think about the tight, shamelessly console-friendly game that was 2010's Battlefield: Bad Company 2 on Xbox 360. Just a bit of a scrap? In a way, Bad Company 2 had no right to be as good as it is. Previous Battlefield games already had higher 64-player limits, jets and sprawling maps, so removing all of that surely seemed like a backward step. This wasn’t such an issue with the console-exclusive Bad Company, but when it was announced in 2009 that the sequel would be the latest Battlefield game for both console and PC, the game came in for scrutiny, rubbing shoulders with the mainline series on PC. Is a battle with up to 24 players even a battle, or is it just a bit of a scrap? Bad Company 2 went on to earn its stripes with distinction, and nine years since its debut it still stands as a demonstration that a Battlefield experience isn’t defined by scale and spectacle, but the amount of memorable moments that it pulls you into. Every aspect of Bad Company 2 – from its slim, slithery maps to its almost completely destructible buildings – coordinated to keep creating these moments. To accommodate Rush, the new defenders-versus-attackers mode, most maps appeared almost linear on the spawn screen. While this was deceptive to an extent, with a high density of buildings allowing for all kinds of flanking opportunities, it also meant that the frontlines were more clearly defined than in other outings. It was tougher to encircle the enemy, while restricting air vehicles to dangerous but vulnerable choppers and UAVs removed that feeling that your assaults or stalwart defence would be undone by an intervention from some unexpected angle. More so than its siblings, Bad Company 2 was a game of toy soldiers, encouraging you to act out war fantasies like shooting choppers out of the sky in tanks, or quad-biking behind enemy lines and hitting a ramp to launch you into a flag’s capture perimeter. With slower movement and everything packed in closer, Bad Company 2 narrowed the power gap between infantry and vehicles, and every game would throw up multiple opportunities to take out tanks in a team or jump out from a crumbling building to slap up a UAV with C4 before scurrying off into a nearby alley. However, the threat of death was ever-present, as the game does away with the prone position and almost entirely removed bullet drop. Bad Company 2 more than compensated for its lack of size, replacing unpredictability and spectacle with urgency and escapades. Sadly, the game is dormant on Xbox these days (though servers are still up and it’s part of the Xbox One backward compatible games list, so there’s always hope). The best way to play it today is on PC, where a large community is still embroiled in its condensed skirmishes. With Battlefield 5 so far not quite living up to expectations, it could mean the next game in the series will shake things up in order to get the juggernaut going again. 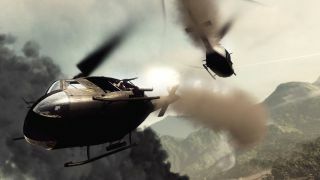 It’s highly unlikely that EA DICE will pare things back to this degree, but that doesn’t mean it can’t learn from it and offer a gleaming twist on the formula that made Bad Company 2 so successful. Bad Company 3 may be a wish too far, but for those like me who appreciate this spin-off’s quirks, a new entry would need to hold onto the spirit of this series outlier: slower-paced, smaller-scaled and offering more evenly matched interactions between man and machine that can make even a halfway decent player feel like a hero.